In my last post I profiled Shoes, a classic Chicago power pop band from the 70s and 80s. Shortly after I wrote it I listened to Reagan Era Rocketship - the recent debut release from local power pop trio The Backroom - and I couldn't help but think of the band as a sort of modern day Shoes, complete with loads of hooks, superb harmonies and a 60s-style lyrical and musical innocence. The disc kicks off with the strongest song, the instantly catchy Lost Without You. This is one of those tunes that's filled with such expert pop craftsmanship that on first listen you'll swear it must be a cover of some old hit single, and will have to take a second glance at the liner notes just to convince yourself it's not. Lead vocalist and songwriter Keith von Kaenel has a pure, straightforward delivery that reminds me of Allen Clapp from California indie pop band The Orange Peels. Reagan Era Rocketship continues in full force with the rocking I Want Out, while halfway through the disc "Loads of Love" stands out as second only to Lost Without You in irresistible hooks and radio-readiness. Other highlights include A Moment of Clarity, Better Time Than Now and Always Wish You Did, the latter two being a pair of peppy, just-over-two-minute gems. The CD is an enjoyable listen all the way through, and I can't wait to hear what the band comes up with next. 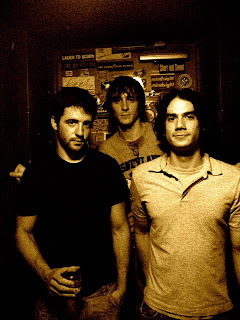 You can hear cuts from Reagan Era Rocketship at The Backroom's official MySpace page. Then head over to CD Baby or itunes and get a copy for yourself.